Written by women experts in the BBQ industry for women with backyard skills or those who want to develop them. Not a bad book for men either, as I enjoyed and learned from it (Not a male ego problem). 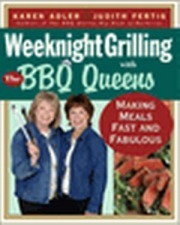 Karen Adler and Judith Fertig are America's leading authors of barbecue cookbooks and this one is delightful. Paperback, tons of recipes.